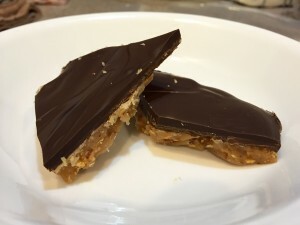 I tried this toffee as Christmas; it was a gift from Steve’s cousin Tina and her wife, Kate. The texture was perfect and I loved the contrast of the sweet candy and the bittersweet chocolate. I immediately asked for the recipe and Tina said she would ask her mother in law. True to her word, I got a text 2 weeks later. I made it tonight and it was just as good as it was at Christmas. I used a 65% dark chocolate on top. As always, I recommend a good candy thermometer. Melt butter, sugar, corn syrup, and water in a heavy sauce pan. Cook, stirring occasionally, to 300 degrees. Stir in nuts, spread in ungreased 9x13 pan. Cool completely. Spread melted chocolate on top. Chill to firm, break in to pieces.